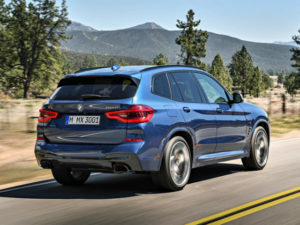 BMW is to add two more engines to its X3 a month after the third-generation model launches. Available from 11 November 2017, the new X3 will initially just offer the 187bhp 132g/km four-cylinder xDrive20d and straight-six 261bhp 149g/km xDrive30d but from December, these will be joined by a new four-cylinder xDrive20i engine variant. Priced from £37,980 OTR, the model comes as standard with eight-speed Steptronic transmission and intelligent all-wheel drive technology, offering 181bhp and a peak torque of 214lb.ft. This brings a 0-62mph time of 8.3 seconds, official combined fuel consumption of 39.8mpg and CO2 emission levels of 163g/km. December will also see the first ever M Performance X3 become available, priced at £48,950 OTR.